Close to upgrading its resource following recent trenching results and weeks away from finalising its Definitive Feasibility Study (DFS), RMX has just discovered new high grade targets which warrant immediate drilling. This could be a repeat of RMX’s South West Breccia resource, based on the size of the soil anomaly RMX has found. The South West Breccia resource stands at 221,000 tonnes at 6.3 g/tonne gold – so an entirely new system of mineralisation of this size would add to RMX’s gold inventory considerably. The upside would be that if drilling is successful, the mineralisation RMX are targeting may link to the Japanese Tunnel zone, another high grade gold section, just 140m southwest of the South West Breccia resource. This could mean its ongoing DFS and the consequent ore body definition could be delayed by several weeks. 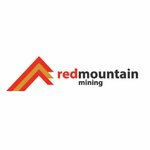 We first started our coverage of Red Mountain Mining Ltd (ASX:RMX) back in March in our article, “ Tiny $3M ASX Gold Miner Set for Near Term High Grade Production ”. Following on from the above articles, RMX has discovered a potentially new resource that could vastly increase its overall Resource size when it finalises its Definite Feasibility Study (DFS) later this year. RMX is now moving full speed to determine the quality and quantity of this potential new resource with the intention of adding it to its Feasibility Study and expanding the amount of gold RMX can take to market. Let’s find out a bit more about RMX. Total Mineral Resources at Batangas include Indicated Resources of 2.97Mt at 2.4g/t Au for 227,000oz and Inferred Resources of 3.22Mt at 2.1g/t Au for 218,000oz. When aggregated, RMX possesses a total of 6.19Mt at 2.2g/t Au for 444,000oz split between its two separate prospects – Lobo (82,000oz) and Archangel (363,000oz). Lobo features an 82,000oz indicated and inferred (604,000t @ 4.2g/t) resource; including the South West Breccia (SWB) lode which has an indicated resource of 221,000 tonnes grading 6.3 g/t Au, most of which will be mined during the initial open pit phase at a very high mining grade of 6.8 g/t Au. RMX is exploring for more high-grade gold at shallow depths as a way of maximising short-term cash flow generation. Archangel holds 363,000 ounces which RMX plans to kick-start in the 3rd or 4th year of the project. 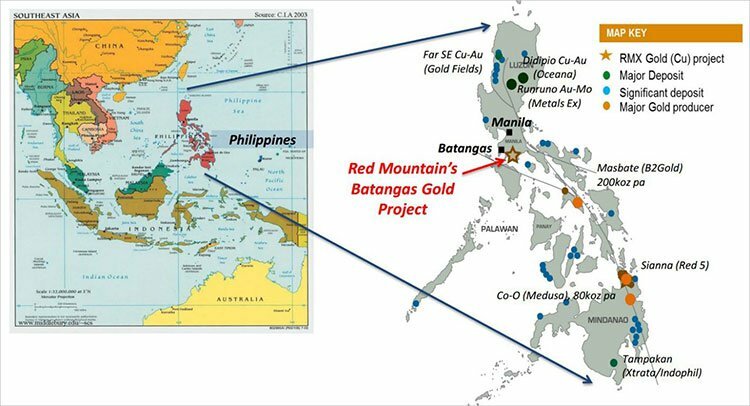 Based on current estimates, the Batangas Gold Project (of which RMX will eventually hold a 50% stake) will generate up to $67M in operating cash flow and $45M in free cash flow over the initial 5 years, which can be used for further resource discovery and to expand the project – both at Archangel where there is a large resource, and potentially at Lobo through discovery of more high grade gold. 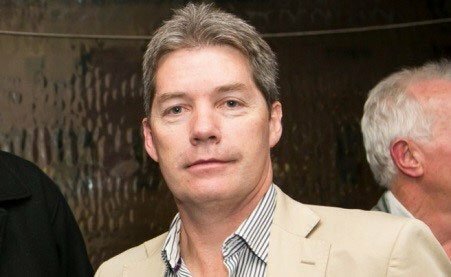 To fund mining development, RMX has sewn up US$1M in strategic funding from Bluebird Merchant Ventures Ltd – to be followed by a further US$4.5 million, expected to come following completion of the Definitive Feasibility Study and full permitting, which will help establish the initial mine development. From this funding support, RMX and Bluebird intend to form a 50:50 joint venture. In addition to its 444,000oz existing resource, RMX recently announced surface gold results that with further exploration, particularly drilling, could add many thousands of high grade ounces to its overall resource. There is no guarantee here though, mining exploration can be risky. Trenching results show RMX has found fresh high grade mineralisation at the Lobo site, including results of 3 m @ 24.2 g/t Au including 1m @ 39.5 g/t Au and 2.1m @ 14.4 g/t Au including 0.6m @ 41.5 g/t Au. In addition, RMX geologists report a “significant soil anomaly” previously undiscovered because of shallow rubble and a large limestone deposit “hiding” the gold, but not preventing detection using soil geochemistry analysis. The newly discovered ‘Tamarind’ anomaly is potentially the same size as RMX’s existing South West Breccia (SWB) deposit which, if proven by drilling, will be a huge boost for RMX, both in terms of JORC resource for its DFS and longer-term commercial viability. Looking at the above illustration, the ‘Tamarind’ discovery is significant according to geochemical analysis. Surface rock-chip results at the ‘Tamarind’ anomaly includes results as high as 31.7 g/t while a sample at the adjacent SWB lode scored 90.4g/t. 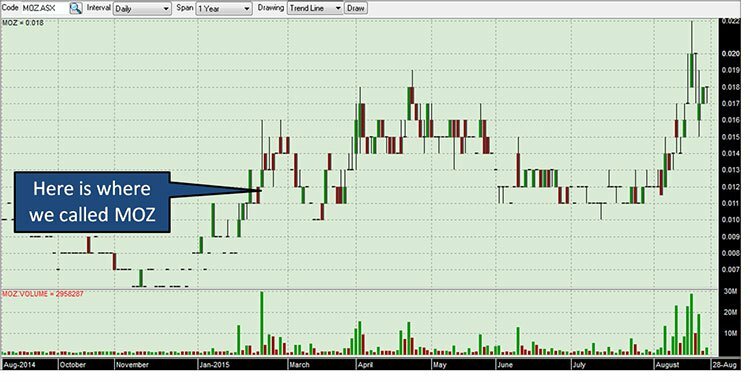 If bonanza gold mineralisation as high as 90.4g/t is struck by the drill bit in the coming weeks, this could be a seminal moment for RMX. If RMX can follow up these kinds of results in its DFS and Scoping study, its future path could literally be paved with gold. On the flip side, if RMX is unable to add the Tamarind discovery to its DFS, its existing Resource is already substantial and robust enough to take RMX into production next year. In order to clarify what it really has beneath the Tamarind hood, RMX recently announced a partially underwritten Share Purchase Plan (SPP) aimed at raising a further $1M from existing and eligible shareholders. The SPP is being underwritten by PAC Partners to the tune of $600,000. As a standard feature of SPP’s, RMX is offering shareholders an opportunity to participate in the new shares at a 20% discount with a maximum allocation of $15,000 per shareholder. The SPP carries no brokerage fees or transaction costs therefore allowing RMX to raise additional funds quickly and at no cost. Shareholder eligibility has been set as anyone residing in Australia or New Zealand although foreign participation will be welcomed subject to any shortfall in the SPP. The attraction for shareholders is the ability to buy up to $15,000 in new shares with no brokerage and at a discount to the current share price and there’s no obligation to participate. 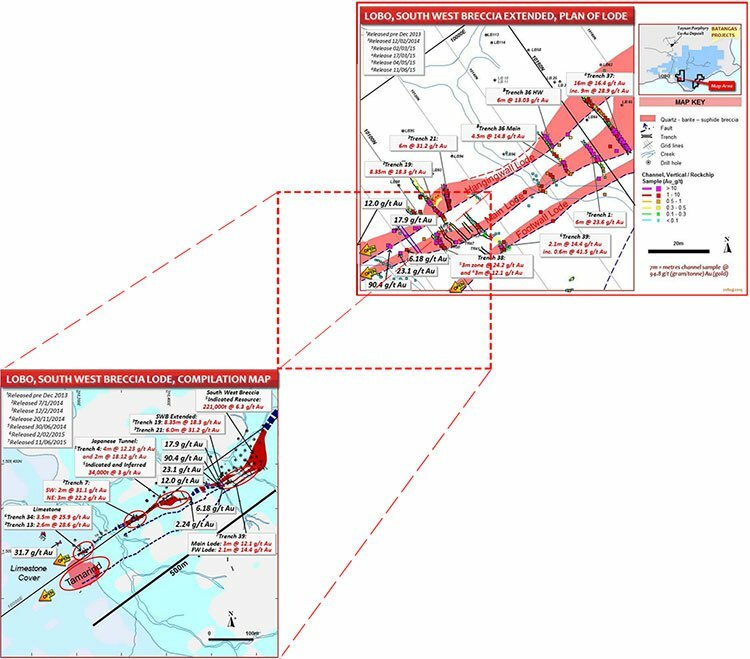 The additional funding will be directed at progressing RMX’s latest prospect – the ‘Tamarind’ target, for a possible repeat of the existing South West Breccia (SWB) resource already in RMX’s arsenal. RMX Managing Director, Jon Dugdale explained that, “We are very keen to drill this target, as it lines up really well with the main, high-grade SWB resource and the soil anomaly is just as big, if not bigger than SWB”. According to Mr. Dugdale, RMX intends to “combine new drilling results with recent trenching results to generate a new SWB Lode corridor resource model”. This will allow RMX to complete its DFS and allow a “minable portion of the resource to be converted to a maiden ore reserve” under the 2012 JORC code. The closing date for interested investors is September 3 rd 2015. In order for a processing plant and production to commence, RMX must obtain an Environmental Compliance Certificate (ECC) from the Environmental Management Bureau (EMB) of the Philippines Government. RMX must also obtain a Declaration of Mining Project Feasibility (DMPF) which requires local endorsement from either Municipal or Provincial authorities. Last month, over 1,200 local residents marched in support for RMX’s activities in the region which also led to RMX submitting a petition supporting the mine development with over 3,400 signatures to the Lobo Municipal Council. RMX currently employs over 50 locals as part of its operations in the area and plans to expand its activities, and employment 10 fold, once permitting is complete and production commences. With local support at an all-time high, RMX is on course to complete its Permitting requirements shortly while simultaneously pushing forward on further exploration, trenching, drilling and updating its DFS. Several converging factors is likely to spell a very busy year for RMX with Q4 2015 now pencilled in as the likely time when all outstanding deliverables are completed. We’ll be keeping an eye on the micro-capped RMX. Whilst a speculative stock and not without risk, based on efforts to date, there is a chance that its market valuation may soon catch-up to its sanguine exploration work.